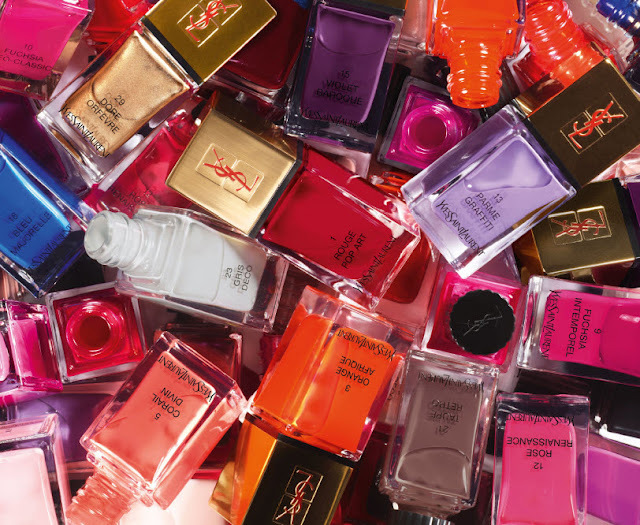 I can’t post about the new range of nail colours from the lovely YSL without including these drool worthy promo images… this is like the make-up obsessives version of a big bag of amazing pick and mix… Gorgeous! I have four colours from the new range to play with and I’m going to be all controversial and say that it’s not the colours I love… but the clear base and top coat! I know, this is so random and to be honest – I do love the colours too. But for the first time since I was probably in school and nail varnish wasn’t allowed I’ve actually been enjoying just using the base/top coat on it’s own. Having said all that the actual colours from the range are gorgeous too. Although you wouldn’t guess it on paper, I actually really like the combo of taupe/grey/gold together… if I was better at nail art I would definitely try something creative with these. Of the shades, I have tried out the Gris Deco one (above) so far as well as the clear – it applies well, two coats to opaque and dried quickly. It didn’t last too great, but I did put it through a lot in the two days of wearing it (Spring clean etc…) so I’ll let it off. Next up, I want to try the gold to set off what minimal tan I have post holiday! What do you think of the new shades, any catch your eye from my pics or the promo pics?? The “Dore Efovre” is such a beautiful colour – I wish i had the guts to splurge all out and buy it, but it’s so dang expensive! oh wow, the whole collection is just simply divine. Ooh, the gold colour looks really pretty! those press pictures are amazing! They look like fab colours but I just couldnt justify the £18 for a nail polish! Love the imagery (and the YSL polishes)! Whoah Gris Deco is STUNNING.